Everyone got fired up to share their manaÊ»o. After a short break for food, a discussion broke out that lasted nearly two hours. Great people, great venue, great direction for a future TEDxVolcano! This entry was posted in TEDx Events in Hawaii, TEDxChange and tagged tedxchange on April 5, 2012 by Brent_Norris. TEDxChange 2012 is a TEDx event co-organized by the Bill & Melinda Gates Foundation and TED. Convened by Melinda French Gates and hosted by Chris Anderson, TEDxChange will focus on issues regarding global health and development. TEDxChange type events are TEDx events hosted around the live webcast of TEDxChange, and also feature local speakers. The TEDxChange team works with TEDx organizers around the world to help facilitate meaningful discussions on topics such as vaccines, polio, malaria, HIV/AIDS, maternal and newborn child health, and agricultural development. The Volcano Art Center will host this yearâ€™s TEDxChange event via global simulcast in Volcano, Hawaii from Berlin, Germany. Melinda French Gates will share â€œThe Big Pictureâ€ theme of TEDxChange and will set the stage as HawaiÊ»i Island residents gather to watch TEDxChange. A special introduction to TEDx will be shared and discussions about TEDxVolcano will be open to those interested in sustainability and related local issues. 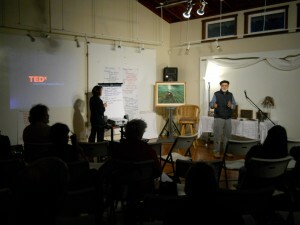 Come support local planning efforts for TEDxVolcano. Potential partners, presenters, volunteers and anyone wants to learn more or already loves TED, should attend. Moderated discussion sessions between presentations will shift â€œThe Big Pictureâ€ dialog of TEDxChange towards the planning and organization of a local TEDxVolcano event to help better understand our local community challenges, opportunities and ideas worth spreading! Public Invited to this Free TEDxChange event! Donations accepted. Â Seating is limited! In the spirit of ideas worth spreading, TED has created a program called TEDx. TEDx is a program of local, self-organized events that bring people together to share a TED-like experience. Our event is called TEDxChange, where x=independently organized TED event. At our TEDxChange event, TEDTalks video and live speakers will combine to spark deep discussion and connection in a small group. The TED Conference provides general guidance for the TEDx program, but individual TEDx events, including ours, are self-organized. This entry was posted in TEDx Events in Hawaii, TEDxChange on March 5, 2012 by Brent_Norris.